Welcome to the politicization of the Obama Department of Justice and the real individuals who should be investigated for colluding to impact an election. The IG report leaked to ABC News, found that former FBI Director James Comey “defied authority” and was “insubordinate” in his behavior at the bureau. Imagine that, Comey thought he was above the law and had a God complex? The IG’s report has been much anticipated and is said to be close to being released in its entirety, all 500 or so pages. Until then, we only have leaks. What we will learn in the IG’s report is that the firing of James Comey was probably the most justified firing in history. 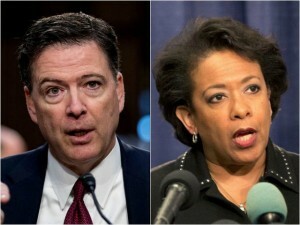 The leaks to ABC News also revealed that Obama Attorney General Attorney General Loretta Lynch hid evidence of Hillary Clinton’s wrongdoing from the American public. Following the colossal failure of of establishment Republicans in the U.S Senate and the lack of any effort by Democrats in either House, President Donald Trump signed an executive order yesterday as the first step in helping the American people with regards to healthcare insurance and hopefully ridding us of the terrible and unaffordable “Affordable Healthcare Act, known as Obamacare. It is about time thee types of provisions were allowed to take place. This should have been done by Congress instead of the creation of Obamacare and the government take over of insurance. Allowing individuals to cross state line to purchase insurance is a no-brainer. Trump’s order will allow agencies to expand the ability of small businesses and other groups to band together to buy health insurance through what are known as association health plans. Even Sen. Rand Paul (R-KY), who has been a critic of previous GOP healthcare legislation to repeal and replace, is defending President Trump’s actions. One has to wonder why things like this were not passed by the GOP led House and Senate? Sen. Rand Paul (R-Ky.) defended President Trump’s use of an executive order on Thursday, after Republicans previously criticized former President Obama for overusing the tool to bypass Congress. “We’re creating something that is freedom. He’s not creating a new government program,” Paul told CNN’s Jake Tapper. “We’ve read the original law and we believe what the president did today is basically an interpretation of the original law, and doesn’t create new territory,” he continued. Trump’s order will allow agencies to expand the ability of small businesses and other groups to band together to buy health insurance through what are known as association health plans. “There’s no government expense to this, and under the First Amendment there is a clause that says we have the right to peaceably assemble. That has been taken over time to be the right of free association, and it’s also been said by the Supreme Court to actually say that we can join together for economic purposes. So all we’re doing is legalizing the ability for individuals to join a group to get better purchasing power. I think it’s sort of a fundamentally American what we’re advocating,” he said.